The 17th November 2018, marks the 150th anniversary of Charles Bradlaugh’s epic political struggle to be elected as MP for Northampton. When he was prevented from taking his seat in 1880 the townsfolk united around him. This became one of the most important political struggles of the 19th Century and eventually, Charles Bradlaugh achieved constitutional reform and greater tolerance, and the advancement of many important campaigns. Shoemaking, the principal industry of the town, has long been associated with atheism and republicanism. ‘The infidel Crispinites’ were Charles Bradlaugh’s most enthusiastic supporters. It has been pointed out that Northampton’s population had a smaller proportion of atheists than other comparative population yet religious non-conformism thrived here in the mid-19th century. 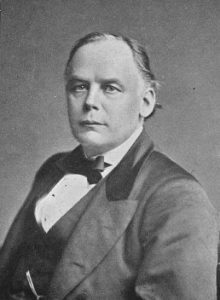 In 1865 Charles Bradlaugh helped to establish the National Reform League to campaign for one man one vote. 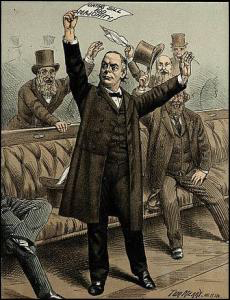 He supported votes for women, but at the time the thrust for women’s votes was on the same basis as votes for men, you had to own property which meant primarily conservative-leaning voters were only eligible, something the Liberals understandably would not welcome, instead support votes for all men including working-class ones which Charles Bradlaugh supported. The National Reform League organised mass demonstrations and public meetings, including one at Northampton Guildhall in 1866. As a result of this agitation, the Conservative government introduced the 1867 Reform Act which extended the vote to every male householder living in a borough constituency and effectively doubled the electorate in Northampton. Charles Bradlaugh wanted to stand as an MP for parliament and promote reforms through Parliament. His friends in Northampton encouraged him to consider standing as a candidate here. 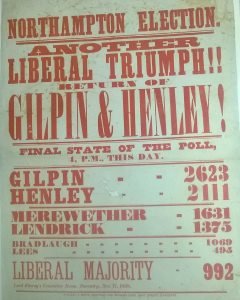 As today, Northampton returned two Members of Parliament, and in 1868 these were Liberals Lord Henley and the more progressive Liberal James Gilpin. Charles Bradlaugh had his eye on his lordship’s seat. However, there was great opposition from the local Liberal Party establishment to his candidature. 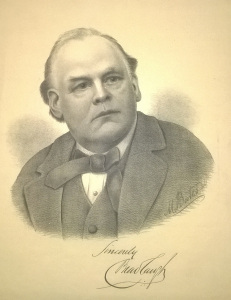 Many other local parties were consulting the membership about the choice of suitable candidates, but not in Northampton, and this led to a serious rift within the local party, for and against Charles Bradlaugh. Charles Bradlaugh had also been encouraged to stand in other towns where there was assured support and a problem-free election. Ironically, it has been speculated that if there had been an open contest in Northampton then he would not have been selected! However, this unfairness led to a serious split and bad feeling within the local party. Charles Bradlaugh had set his heart on Northampton and was obliged to stand independently as a Radical. There were great efforts to discourage support for him, and a strong ’tinge of bigotry’, his personal morality was questioned and voters were told that any Christian who supported him would be offending God! 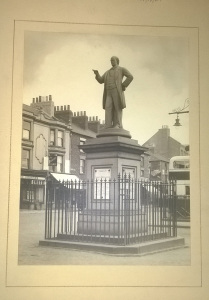 The libellous ‘Watch Story’ was published and circulated, alleging that Charles Bradlaugh had stood on the market square and challenged the Almighty, if he existed, to strike him dead within ten minutes! 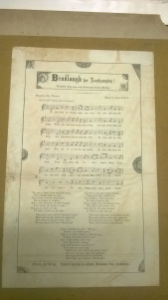 Supporters in the Staffordshire Potteries unable to send financial support manufactured 100-pint pots decorated in mauve and green and inscribed ‘Bradlaugh for Northampton!’ They were sold for a shilling each. Northampton Museum has a pair of these mugs in its collection. Later that year there was a by-election following the untimely death of James Gilpin who had won a seat from the Tories. The local liberal establishment hostility continued, and the atmosphere was further poisoned by the Liberal candidate William Fowler who questioned Charles Bradlaugh’s character and morality. 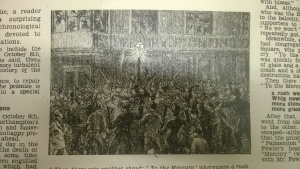 Charles Bradlaugh’s supporters were becoming increasingly frustrated, and when the results of the election were read out on the market square there was shouts of the fixed result, recount!’ Brawls broke out, and these developed into a night of serious rioting. The mayor read the riot act and the local militia fired shots above the crowd. 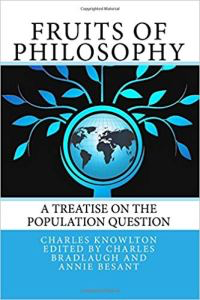 Charles Bradlaugh’s Notoriety increased when he was prosecuted alongside Annie Besant for republishing a birth control manual, ‘The Fruits of Philosophy’ by Frederick Knowlton, described by the Public prosecutor at their trial as a ‘dirty, filthy book’. The pair were sentenced to six months but escaped imprisonment on a legal technicality. Charles Bradlaugh expanded public knowledge of reproduction and contraception and initiated the process of dismantling the obscenity laws. Prior to the general election of 1880, the Liberals attempted to find another ‘Radical ‘ candidate to challenge Charles Bradlaugh, but nobody stepped forward, and they selected a ‘gentleman’ the Right Honourable Acton Smee Ayrton. Unfortunately, shortly before the election, he was seriously injured after falling from his horse. Moses Manfield, shoe factory owner and Liberal Party supporter of Charles Bradlaugh, travelled to London and consulted with the party’s Chief Whip and a joint platform was agreed with the Liberal candidate for the town’s second seat ‘Radical’ Henry Labouchere. There was now liberal unity and both candidates were successfully elected to Parliament!